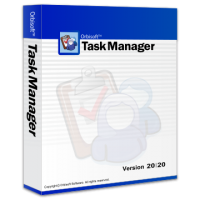 Use Orbisoft’s latest award-winning Task Manager 20|20(tm) business task management software to get organized and manage all your team’s jobs and tasks effortlessly. Task Manager 20|20 can be used personally or in a team environment to track personal and shared tasks, jobs (including customer jobs) and projects. Get a quick-view of all your tasks, guard against missed deadlines, balance workloads automatically and forecast work bottlenecks and quiet times. Sample reports include: tasks listed by deadline or date received, tasks by team member, tasks currently overdue, tasks due today, task time budgets, workflow trends, time allocation pie graphs, main/sub-tasks, and many more. Easy data entry allows for minimal time spent logging and closing off tasks. Analyzing task statistics and work trends is fast and simple with built-in analytics. Customize fields, templates and reports while getting a wide variety of these already built in. Customizable email reminders, field, program and table security, ActiveX fields, auto-scheduling, auto-lookup, and many other advanced features are available. Task Manager 20|20 is a ‘must-have’ if you are losing track of your office tasks, jobs and projects. Whether you want taskmanagement software or project management software just for yourself or for your teams, the benefits gained from the easy use of Task Manager 20|20 are combined with the feeling of knowing all your tasks are accounted for and under tight control!